St Clare HospiceLotterySt Clare Lottery rollover won at £10k! St Clare Lottery rollover won at £10k! A lucky St Clare Lottery player has won our rollover at £10,000! A cheque for a record-breaking £10,000 has been presented to the winner of St Clare Hospice’s Lottery rollover. The jackpot was scooped by a player from Bishop’s Stortford who won the top prize on Friday 26th October 2018. The rollover prize, which hasn’t been won for more than 50 weeks, had grown to the maximum of £10,000 before it was won by the lucky supporter, who has asked to remain anonymous. The last rollover jackpot the St Clare Hospice Lottery awarded was for £9,200 which was won back in October 2017. It has never previously reached its maximum of £10,000. 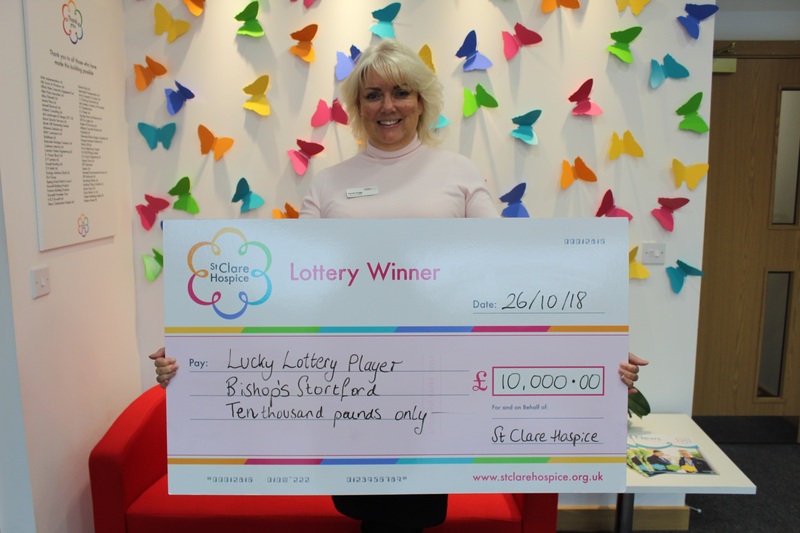 The St Clare Hospice Lottery has been running for over 20 years and currently has more than 15,000 weekly entries, which generate more than £300,000 in profit for the Hastingwood-based hospice every year.